This add-on device for telephones can be connected in parallel to the telephone instrument. The circuit provides audio-visual indication of on-hook, off-hook, and ringing modes. It can also be used to connect the telephone to a cid (caller identification device) through a relay and also to indicate tapping or misuse of telephone lines by sounding a buzzer. In on-hook mode, 48V dc supply is maintained across the telephone lines. In this case, the bi-colour led glows in green, indicating the idle state of the telephone. The value of resistor r1 can be changed somewhat to adjust the led glow, without loading the telephone lines (by trial and error). In on-hook mode of the hand-set, potentiometer vr1 is so adjusted that base of t1 (bc547) is forward biased, which, in turn, cuts off transistor t2 (bc108). While adjusting potmeter vr1, ensure that the led glows only in green and not in red. When the hand-set is lifted, the voltage drops to around 12V dc. When this happens, the voltage across transistor t1’s base-emitter junction falls below its conduction level to cut it off. 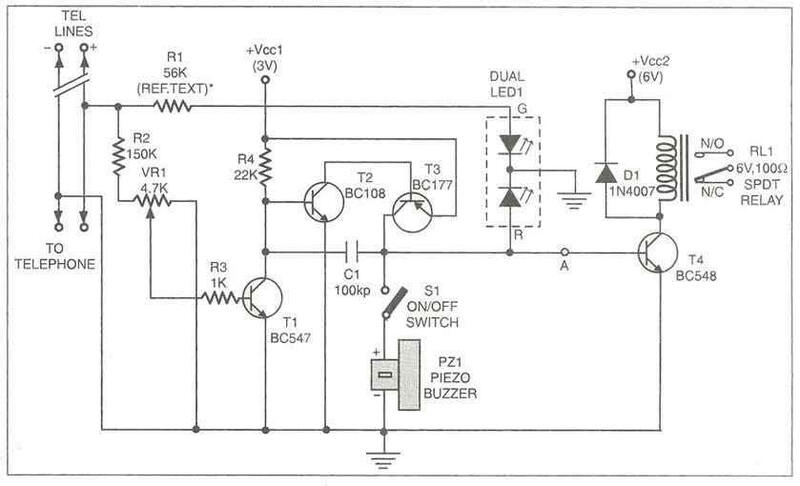 As a result transistor pair t2-t3 starts oscillating and the piezo-buzzer starts beeping (with switch s1 in on position). At the same time, the bi-colour led glows in red. In ringing mode, the bi-colour led flashes in green in synchronisation with the telephone ring. 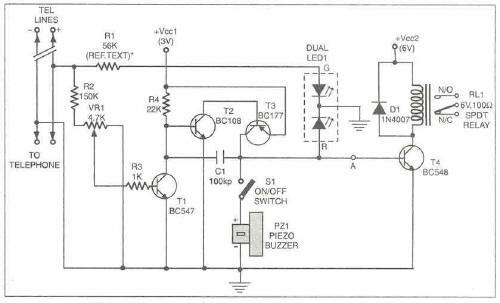 Multipurpose Circuit for telephone electronic circuit. Telephone related electronic circuits and schematics.